View cart “Ab Spirit Eau De Toilette Spray By Lomani 3.3 oz Eau De Toilette Spray” has been added to your cart. 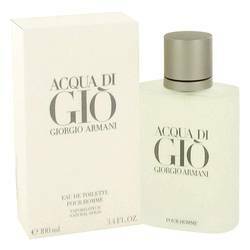 Acqua Di Gio Cologne by Giorgio Armani, One of the most popular and iconic men’s fragrances of the 20th and 21st century, acqua di gio was composed in 1996 by fifi award winning master perfumer alberto morillas and ushered in a new age of fresh citrus/aquatic scents for men. This classic men’s cologne opens with brisk and cool calabrian bergamot, green tangerine and neroli, and gradually grows deeper and richer with notes of rose, rosemary, jasmine petal, persimmon, and indonesian patchouli. As timeless as a white tee and well worn jeans.